Quinton Rose and his Owls teammates are tied for fourth place in the AAC. The race should be fierce to earn one of the first four spots in the 12-team American Athletic Conference basketball standings and receive a first-round bye in the conference tournament. Actually, spots three and four are the ones that should really be up for grabs, with an emphasis on four. Temple (17-7, 7-4 AAC) is tied for fourth place with South Florida as the Owls prepare to host SMU (12-11, 4-7) on Wednesday. In the AAC, Houston (23-1, 10-1) and Cincinnati (20-4, 9-2) are seen as locks to make the NCAA Tournament. Preseason favorite Central Florida (17-5, 7-3) is in third place. Temple still has to play both Florida teams, facing USF on the road and UCF at home. The Owls lost on the road at UCF and own a home win over USF. Behind the Owls in the standings are two teams, Memphis (14-10, 6-5) and Wichita State (12-11, 5-6, winner of four straight games), that are also threats. Then there’s Tulsa (14-10, 4-7) which just soundly defeated the visiting Owls, 76-58, on Saturday. Here are Temple’s remaining games: home vs. SMU, at USF, home vs. Tulsa, at Memphis, home vs. Tulane (4-18, 0-10), at UConn (13-11, 4-7), and home against UCF. First up is SMU, which has lost four in a row, but only by a total of 14 points. The Mustangs are outrebounding teams by 4.6 per game, which could prove to be challenging for Temple. “We have to do a much better job of rebounding and keeping teams out of the paint,” McKie said. This season, the Owls are grabbing 34 rebounds and allowing 36.4 per game. In Saturday’s loss, they were outrebounded, 37-31. SMU is led by 6-foot senior Jahmal McMurray, who is averaging 17.5 points and shooting 38.1 percent from three-point range. “He is definitely a guy who has established himself as a scorer in a our league and has put up some really good numbers,” SMU coach Tim Jankovich said. Other key players for SMU are 6-3 junior Jimmy Whitt Jr. (12.9 ppg. ), 6-8 sophomore Mike Isiaha (12.3), and 6-9 sophomore Ethan Chargois (12.3). 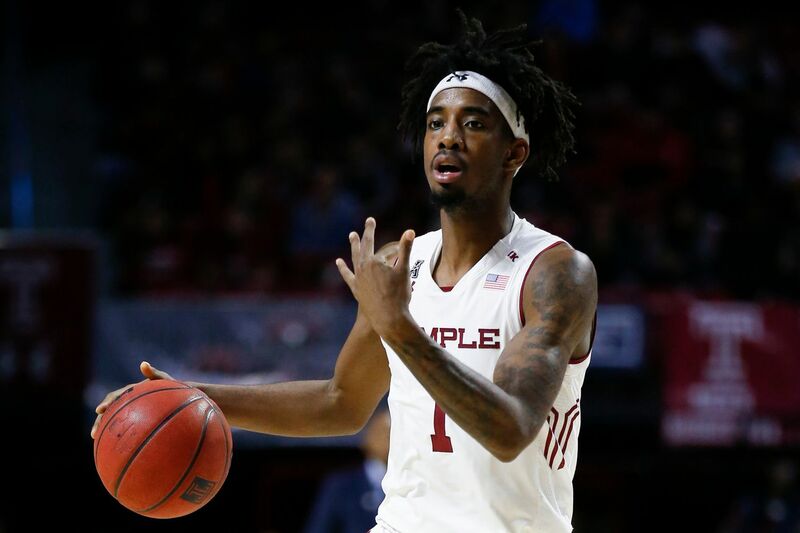 Temple usually needs to get strong performances from its leading scorers, 6-4 senior Shizz Alston and 6-8 junior Quinton Rose, to beat most teams. Against Tulsa, the two combined to shoot 6-for-26. McKie is confident in the Owls but realizes that Temple, which has lost four of its last seven games, must turn things around now.